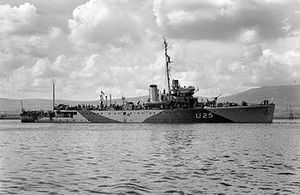 My late grandfather on my father's side joined the Royal Navy in 1919 and was eventually demobbed in 1945 with the rank of Chief Petty Officer. Although he died when I was about two years of age I have in my possession all of his service records including the details of where he served and I also a photo album of pictures taken aboard the Hastings class sloop HMS Scarborough on her tour of central and South America in 1934 aboard which he was serving at the time. Amongst his papers there is also a certificate given to him by the Sheerness local council in recognition of his war service. I will detail his life afloat in a future post as I am awaiting some other details in order to round out the story. I mention this because today was the day that my late grandfather's daughter - my Auntie Pearl - was laid to rest and so Laurel and I went to the funeral service at the Hastings Crematorium quite close by to where she and her husband lived. For various reasons many of my father's family were new to me and so much history came to light at the ensuing wake from a number of previously unknown relatives. One snippet of particular interest came from a second cousin whom is currently compiling the family tree. 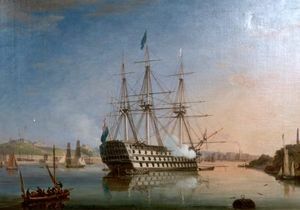 It appears that the naval tradition is a long standing one in the Crook family as there is recorded as a direct descendant a Thomas Crook that served aboard HMS San Jose during the Napoleonic wars. HMS San Jose was captured from the Spanish at the battle of Cape St.Vincent in 1797. The said second cousin is going to provide me with fuller details and so I will pass these on in due course. The funny thing is that although I was born by the sea I never really considered the Navy as a career choice - I wanted to go into the RAF but didn't meet the required standard - so I suppose that my ongoing and seemingly all-consuming passion for ships and the sea is some kind of subconscious acknowledgement of my ancestral heritage! My granfather's naval papers were passed to me by my Auntie Pearl a few years ago as following my father's death in 1995 she wanted the eldest male of the Crook line to have them (she was 87 when she died and is survived by her husband, my Uncle Jim - a former RAF Wellington Bomber pilot who is 90 years young). To her then, and her memory, I extend my warmest and heartfelt thanks for everything. Having gone down the family history route myself, I can tell you that you are going to find out all sorts of things that will interest and intrigue you. I cannot take the credit for the research as my second cousin is way ahead of me in that respect. As you rightly say though - many things of interest will come out of the woodwork - originally our branch of the Crook family hailed from Devon and there is also a touch Irish somewhere along the line.